A third of Cameroon’s athletes attending the Commonwealth Games in Australia have gone missing, the team said in a statement Wednesday. They left in waves, with three going missing on the night of April 8, another two vanishing on April 9 before the remaining group left at night on April 10. Two of the eight left without competing. Team attache Simon Molombe said he did not expect them to return. “I don’t think they will be back,” Cameroon’s Molombe told CNN Sport, confirming their disappearance had been reported to Australian police. “Most of them departed in the night when everyone was sleeping. Nobody knows the direction they have gone,” Cameroon team spokesman Simon Lyonga said. The athletes’ visa requirements expire on May 15, allowing them to spend another month legally in Australia. David Grevemberg, Commonwealth Games Federation CEO, said the situation remained an issue for the Cameroon team until the athletes breached their visas. “It is obviously disappointing that some of the athletes who have come didn’t compete when scheduled to compete,” he said at a press conference Wednesday. Cameroon’s Simplice Fotsala (left), pictured during the 2018 Gold Coast Commonwealth Games on April 6, is one of the athletes listed as missing. The 2018 Games are currently underway in the Gold Coast in the Australian State of Queensland. They’re expected to conclude on Sunday April 15. It is not the first time athletes have disappeared during major sporting events. 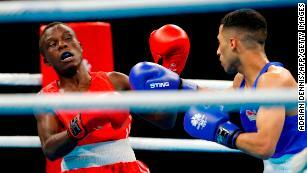 Olivier Heracles Matam Matam of Cameroon, here competing on April 5, has been listed missing by his team. 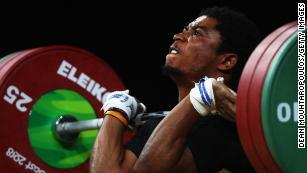 At London 2012, seven Cameroon athletes disappeared during the Olympics. Peter Beattie, chairman of the local organizing committee, said it was not a surprise. “Frankly, the bottom line is it happens regularly within Australia, there is a mechanism in place to deal with it and I don’t get too excited by this,” he told reporters Wednesday. In January, Australia’s Home Affairs Minister Peter Dutton warned athletes who were planning to attend the games they needed to follow the country’s laws. “Our message to the half a percent of people who might think that they can overstay a visa or not act within the conditions of their visa is that Australia has very tough laws and they need to abide by the law,” he said in Canberra on January 30.